We welcome our latest artist, Michael Hermansen, with the opening of his first works in an exhibition titled "CLOSER LOOK: SERIES 1". These over-sized, hyper-real paintings are breathtaking to view. Michael has been fascinated with the natural world ever since he was a boy. Hours would pass by as he patiently observed the lives of ants, beetles and frogs out on the farmlands of central Minnesota. 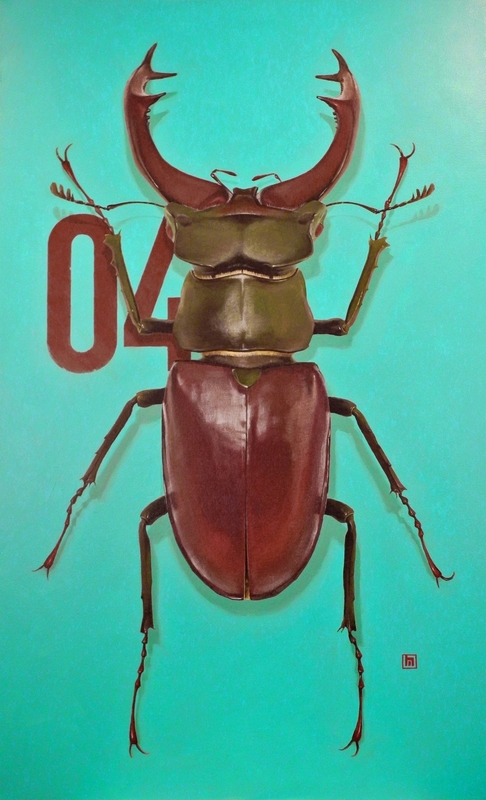 His ongoing series of large-scale acrylic insect paintings combines his interest in science, art and design. The beautiful little things in nature are transformed into something new and fascinating by virtue of the scale at which they are represented. The close examination required to paint these large beetles and butterflies have made him even more fascinated with the cleverness of mother nature. Coming to an understanding of the mechanics of dragonfly wings simply through close examination is nothing short of a spiritual experience. As a designer by trade, he takes a very graphic approach to these paintings and the careful selection of subjects, background colors and typography usage. The numbers act as a means to catalog this large insect collection but also add another interesting visual element to the composition. Michael Hermansen is a designer and artist who lives in Minneapolis, MN. As a rural Minnesota native, Michael uses his love of nature and science as the inspiration for his art.